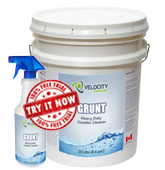 GRUNT is a heavy-duty caustic cleaner that is effective in removing grease, oil, bitumen, pitch & other soils from heavy duty machinery & exterior surfaces. It is typically used by railroads, mines, pulp and paper mills, sawmills, plywood mills, transportation companies and maintenance shops. Mine equipment cleaning – Pre-soak at 25%-50%. Pitch (plywood/lumber) – Driers, skidders, feller bunchers, trucks, etc.- used at 10% (foamed or sprayed). Bitumen (oil sands) – Industrial equipment, floors, etc.- used at 5:1 to full strength depending on soil conditions. Foam application – used at concentrations from 10%-20% for heavily soiled areas. High pressure wash – use 0.5-1.0% at the tip.